There is no disputing the fact that Delhi has among the most stressful lifestyles in today’s world. The hustle and bustle of the city might appeal to people for some time, but the fact is the traffic, the pollution, the never-ending crowds and the noise of the city can get very suffocating after a certain point of time. It becomes necessary to move away from the city a bit to disconnect yourself from the crowd and refresh your senses. Manesar is one such idyllic locale which is not too far away- just a couple of hours drive from Delhi and is not very remote either, with all modern amenities available. It is full of farmhouses, resorts,and hotels for the urban traveler who needs to unwind and relax on the weekends. Below is a list of best resorts in Manesar for spending the weekend. The Golden turtle farm is one of the most relaxing destinations in Manesar. 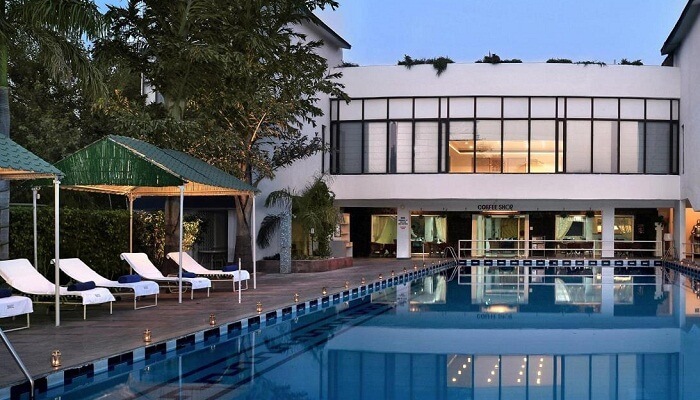 Situated at a distance of just about 45 minutes from Gurgaon and spanning over a lavish area of 4 acres, this resort is everything you can ask for from a weekend getaway. It contains 6 lavishly designed bedrooms ideal for your entire family or friend circle to stay in, with a DVD library to keep you occupied during the night time. For the day, you have outdoor games like basketball, cricket, tennis, football or if you are more of the indoor type, you can play caroms or curl up on the sofa with some books. If you are more adventurous, you can indulge in the Burma bridge, rope walk, flying fox and commando net as well. It also features a kitchen garden from where the vegetables for your food are sourced. Heritage Village Resorts And Spa is among the most well-known properties in Manesar. The theme has been designed to imitate the historic and architecturally and aesthetically pleasing Rajasthanihavelis. It is due to the amazing theme design and maintenance that it has won the national Tourism Award from the Government of India. It is an astounding combination of modern facilities, Rajasthani traditional architecture,and artwork, elegance in design and immaculate use of colors to meld it all together. With over 150 rooms housing hundreds of guests at a time, this resort truly boasts of an experience like none other. It has a spa, swimming pool and several in-house restaurants like the Jharokha, Surya Mahal, Bhangra Beat and Bara Handi apart from a Tea Lounge and a Bar. The huge variety of food offered across these restaurants ensures that everyone’s palate is satisfied. Best Western Country Club Resort is another lavish and huge resort that is perfect for a huge party or a gathering over the weekend. With more than a hundred modern rooms equipped with every amenity you could think of, amazing restaurants serving lip-smacking food, sports grounds with a huge selection of sports to choose from. You could choose to [play cricket, mini golf, or enjoy in the mini amusement park with your kids. If you are the athletic type, go for rock climbing or camel and horse rides or just go for bird watching and finish off your day with the rain dance! The TarudhanValley Golf Resort is probably the best golf resort in Manesar. If you are a golf lover, you would know that choosing a golf course to spend your holiday is going to vex your wife and children a lot. That is until you choose a location that provides some entertainment to them as well when you are out golfing with your friends. Tarudhan Valley Golf Resort is the answer to your requirements in such cases. With a provision of over 70 luxurious rooms with modern facilities, this resort boasts of a golf course, an archery range, an amazing spa experience, a lavish swimming pool, fitness center, outdoor sports like basketball, badminton and football apart from a host of other features. The Club Awara Holiday Resort is a serene location perfect for those looking for a silent and quiet getaway for the weekend. It is spread out across a vast area with 14 rooms and cottages to give you peace and quiet and promote a sense of exclusivity. You can take long walks in the gardens or indulge in adventure activities like rope walk, commando net, flying fox, jumaring or the favorite outdoor games- football, cricket etc. It is definitely not a lavish property but is designed for those who want to spend some quiet time with their family and friends and create an atmosphere of camaraderie and enjoyment. Whenever you head out to Manesar for the weekend, remember to consult this list so that you can make a decision on your location based on the likes and dislikes of your family.